Update, May 3: PUBG’s War Mode is coming back. A new and improved version of PUBG’s deathmatch mode, War, launches today. War Mode: Desert Knights, as it would appear PUBG Corp are calling it, was announced last night. Savage is the PUBG map that Miramar should have been. It’s much the same sort of formula as before – teams of players drop into a small, pre-determined spot on the map, and earn points for kills and knockdowns. If you die, you’ll respawn next time the plane launches. The first team to 200 points wins. There are, however, a few changes this time around. For one thing, War is coming to Miramar this time around, and teams will be smaller – you’ll queue up and play as one of ten five-person teams. The zone is slightly larger than before, and players will start the game with better loot than before – you’ll automatically be given a care package weapon (think AUG, AWM, etc) as well as level three helmet and armour, and the luxury of two whole grenades. War Mode will be available from 19:00 PST today (04:00 BST tomorrow), and will run until 19:00 PST on May 6 (04:00 BST May 7). You can check out the full announcement and rule-set here. Original story, April 13:PlayerUnknown’s Battlegrounds’ latest event mode is War. Billed as “PUBG’s most deadly Event Mode yet,” anannouncement on Steamconfirmed that War Mode is available now. War Mode, which first showed up as a limited-access custom mode a couple of weeks ago, is a 30-player Team Deathmatch mode. 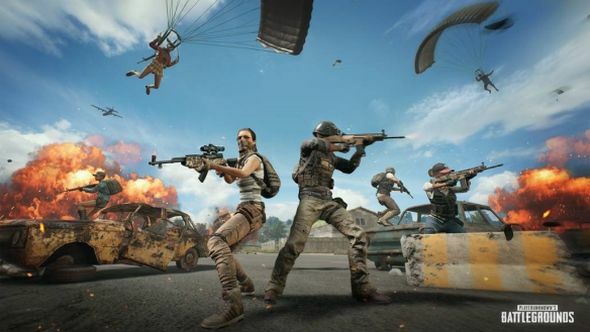 When you join the game, you’ll be assigned to one of three ten-person squads, and will drop into a small area of the game’s Erangel map which does not change size of the course of the game’s 15-minute running time. If you die, you’ll end up back in the plane and be able to parachute back into the game.The game mode will allow you to play in both first- and third-person perspective (only in third person on the KR, JP, and SA servers). The game ends when one team reaches 200 points, or when 15 minutes has passed (at which point the team with the most points wins). Killing another player is worth three points, while knocks and revives are both one point. Knocking or killing a friendly player will incur a five point penalty. All players are guaranteed to spawn with a random assault rifle or DMR, a random pistol, a level one helmet and vest, and one grenade. More loot can be found in buildings, and care packages will drop every 90 seconds. PUBG’s War event is live now (it went live at 3am BST this morning) and will run throughout the weekend, ending at 3am BST on Monday, April 16 (19:00 PDT, April 15).